August smallmouth bass fishing is an incredible outdoor activity during these summer months. Pennsylvania is a hot spot for catching big smallmouth bass in numbers. Lake Erie continues to produce excellent fishing for everyone that explores it every year. It is the perfect getaway for your loved ones and families. Capt Mark Rose is a local expert that has been fishing the lake for years. Every hump, bay, rock and big bass hole has been uncovered and fished. When you are looking to catch quality numbers and fish, Captain Mark is the man to fish with. Explore Lake Erie next time you are visiting for a fishing adventure of a lifetime! Captain Mark had the pleasure of fishing with Abby and Derek while they were visiting Pennsylvania. You never know what to expect when you adventure out on Lake Erie. They went out on an early morning fishing trip in search for a top water bite to remember. Summer months will raise smallmouth bass early in the morning and drop them further into cooler waters during the day. Abby and Derek had an absolute blast fishing for smallmouth bass with Captain Mark Rose. They caught 50 plus bass throughout their trip. Several of those bass came on top water walking baits along with grubs and senkos. Soft plastics are essential when fishing for smallmouth bass. Make sure you always have a selection when adventuring out! Captain Mark is looking forward to fishing with this great couple again in the future. Shortly after this awesome fishing trip, Captain Mark went out on a two day fishing adventure. Gary and his friends were traveling from the Carolinas looking to hook into some smallmouth bass during these summer months. Two days of action got the job done. These summer months are getting hot and pushing the smallmouth bass deep in the water column. 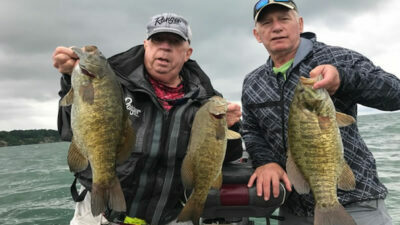 Gary and his friends caught 20 Smallmouth Bass on both days of fish with the biggest bass weighing in at 4.75 pounds. They were really excited to catch a big bass and Captain Mark got it done for them. Drop shot is a very effective method while Bass Fishing Lake Erie. This was their first time catching bass on drop shot and it came on Gary’s first cast. These gentlemen caught bass everywhere on the lake from Shades beach to the Ws. Along with catching the bass on drop shot, tubes and ned rigs were also very productive. Gary and his friends had a blast and are looking forward to the next time they Visit Erie! Don’t miss out on your Lake Erie Fishing adventure these summer months. Fall is fast approaching making for another great opportunity to catch some big bass as the water cools off. Contact us here at Bass Online with any questions you may have!